With Business Intelligence Gateway, you get fast, easy, access to the information you need to outthink your competitors and crush your business goals. As the operations honcho for your organization, you call the big shots on contact center operations. But the information you need to do your job well comes from multiple channels: IVR, chat, mobile, whatever. Which means it’s hard to step back and see the big picture, and even harder to figure out how to capitalize on it. Ditto for program managers and analysts. But that’s what’s so cool about the BI (Business Intelligence) Gateway. 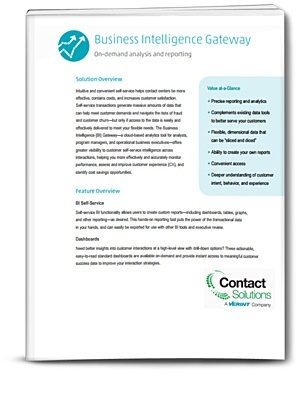 With its self-service platform, and intuitive dashboards and reports, you get fast, easy access to tons of Contact Solutions customer interaction data, to make smarter business decisions. Imagine a sophisticated BI tool that’s so user-friendly, you don’t need a degree in data science to use it. That’s the appeal of BI Gateway. It’s effortless, even for honchos who haven’t embraced their inner geek. For example, non-IT program managers, analysts and business execs can quickly run reports, and explore, compare, and share high-level and detailed data from multiple channels with the click of a mouse, without using complex query languages, clunky spreadsheets, or waiting hours, days or weeks for technical assistance. The best brands understand how to get ahead of the CX curve and stay there. BI Gateway helps you stay on top by bringing together all of your interaction data in a single, user-friendly platform that allows you to spot CX improvement opportunities, based on unique variables, like how individual callers actually behave in your IVR. Sound complicated? Nope, it’s BI Gateway from Contact Solutions. See for yourself how the Business Intelligence Gateway can help expand your knowledge base and equip with with the data you need to make smart decisions.